As in past years, Peter Pap, our fellow Hajji and important exhibitor at the Winter Antiques Show will be occupying his usual corner booth. We are really thrilled that Peter has once again invited us for his informative and visually stimulating booth talk. 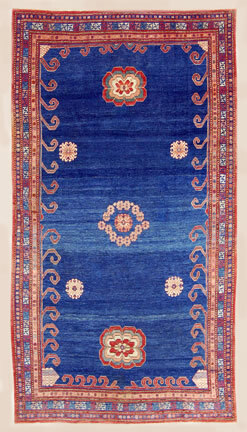 This early Khotan Rug is just one of the pieces Peter will have at the show. We look forward to his providing details about this piece as well as the opportunity to see other textiles on exhibit this year. Peter is providing complimentary entrance for attendees. (We are all responsible for our own coat check, a nominal fee ). Given the size of his booth, attendance will be limited to 25.This event has filled quickly in the past so respond right away if you’re interested. The talk will begin at 6 P.M. and will last about an hour. The show closes at 8 PM, so there is ample time to see the rest of the show if you are interested, or should you choose, you can come early. The 62nd Annual Winter Antiques Show, held annually at the Park Avenue Armory, (67th Regiment Armory) will kick off this year on January 20th running through January 29th, 2017. The Winter Antiques Show’s 2017 loan exhibition commemorates the 60th anniversary of the Abby Aldrich Rockefeller Folk Art Museum (AARFAM) in Williamsburg, Virginia, one of the art museums of Colonial Williamsburg. Abby Aldrich Rockefeller Folk Art Museum: Revolution & Evolution offers a selection of highlights from the museum’s collection, including ceramics, sculpture, drawings, paintings, fraktur, furniture, weathervanes, utilitarian objects, needlework, quilts, toys and more.